It was a beautiful January Saturday morning in Miami and I decided to start my day be taking a drive over the MacArthur Causeway to have breakfast at Joe’s Stone Crab. I have eaten at Joe’s many times for dinner, but never for breakfast. I kept hearing wonderful things about the stone crab omelet, so I decided to start my morning with the house specialty. As I waited for my breakfast, I reflected on the story of how Joe’s got started. This restaurant has been around throughout the entire history of Miami Beach. The people and stories about Joe’s are as fascinating as the cuisine. I wanted to focus the first Blog entry of the 2012 recounting the story of Joe’s Stone Crab. Joe and Jennie Weiss were both born in Hungary and immigrated to New York at the turn of the 1900s. According to Joe’s granddaughter, Jo Ann, he worked at a Brooklyn restaurant very similar to the first incarnation of Joe’s Diner on Miami Beach. It was 1913 when Joe borrowed $50 on a life insurance policy and headed down to Florida seeking relief from his asthmatic condition. Respiratory problems were a common reason that people from the North migrated south for the temperate climate offered by South Florida in the winter time. Joe left behind his wife and son, Jesse, who was 6 years old at the time. They later joined Joe in Miami. At first, both Joe and Jennie worked odd jobs on the Miami side of Biscayne Bay. However, they eventually went over to Miami Beach to operate the lunch counter at the Smith Bathing Casino. At that time, Miami Beach pretty much consisted of only a couple of bathing casinos (not to be confused with gambling casinos), snakes, mosquitoes and other small rodents. Joe’s Diner served excellent food, but it wasn’t until Joe struck up a conversation with a Harvard Professor that he was introduced to what is now a staple of Joe’s – the stone crab. George Howard Parker was staying in Miami Beach for a few weeks to study the Portuguese Man of War. He was brought to Miami Beach by Midwest Industrialist Jim Allison, who was opening an aquarium at Fifth Street. Parker arrived in early June of 1921 and departed in Mid-July. The professor came to Joe’s for breakfast and asked about the stone crabs. Joe replied that no one would eat them. Later that day the professor brought a burlap bag full of live stone crabs and both he and Joe began trying methods to cook them. Eventually, they decided to boil the crabs in a big pit located in the middle of the restaurant at which time they determined that they found the right approach to cooking stone crabs. When Joe’s started serving stone crabs, they were served with hash brown potatoes, coleslaw and mayonnaise. They charged 75 cents for four or five stone crabs, 25 cents for potatoes and 25 cents for an order of coleslaw. 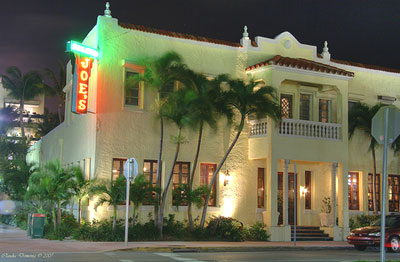 Later, Joe’s would offer stone crabs with their signature “Joe’s Mustard Sauce”. After Joe passed away in 1931, his son Jesse began playing a major role in the running of the business. Jesse was a larger than life character who had the ability to attract prominent people to Joe’s. 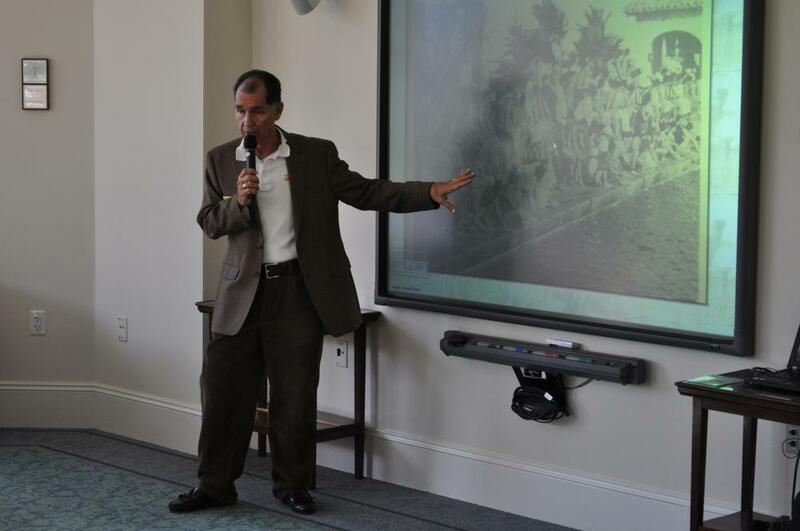 Some of the guests through the years included Al Capone, J Edgar Hoover, Walter Winchell, sitting presidents and all kinds of entertainment figures, athletes and politicians. Joe’s had become more than a destination, it had become an institution. The restaurant grew in the boom of the 1920s and even during the depression years of the 1930s. Joe’s expanded the building on a number of different occasions. Shortly after the United States entered World War II, Jesse Weiss enlisted in the Army as a second lieutenant. Jesse left the restaurant to his fourth wife, Mildred, but after he returned in 1945, Mildred was gone and Jesse was married to Grace Babbitt, who he met stationed in Champaign-Urbana, Illinois. Given that Jesse had given his ex-wife, Mildred, power of attorney to run the restaurant, Jesse determined that it was easier to change the name of the restaurant rather than trying to get back the power of attorney. That is when “Joe’s Diner” became “Joe’s Stone Crab”. Through the years, Joe’s has always managed to stay in the spotlight. It even managed to become part of the infamous Watergate Scandal that brought down the Nixon Presidency. When the Watergate Committee counsel Sam Dash asked about the nature of one of G. Gordon Liddy’s tape recordings, Liddy’s secretary could only confirm that the only thing she remembered were the words “Joe’s Stone Crab”. Finally, my stone crab, spinach and feta cheese omelet arrived. It was every bit as good as advertised. After enjoying the omelet, I can certainly confirm that the breakfast experience is every bit as interesting and enjoyable as Joe’s colorful history. If you would like to learn more about the history of Joe’s Stone Crab, there is a wonderful book entitled “Eat at Joe’s” that can be purchased right in the carry out area of the restaurant. It was co-authored by Jo Ann Bass (granddaughter of Joe and daughter of Jesse), and Howard Kleinberg (noted editor and columnist).